“The following is a plea from my personal friend, Ginger Kathrens. There is nothing contrived or over-inflated in her urgent plea for help as I have personnally looked into the vacant eyes of those who manage the BLM office in Billings Montana and there is not a heart or soul to be seen. They do what they do to the special horses of the Pryor Mountains because, and I quote, ‘We Can’! 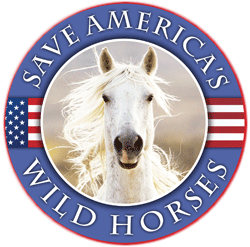 As volunteer President of the Wild Horse Freedom Federation I publicly state that we stand beside Ginger and the Cloud Foundation in asking you all to click on the link at the end of this letter and follow the guidelines on how you can help in stopping this BLM travesty. We cannot stand quietly and let Cloud’s herd disappear into the night, we simply cannot allow it!” ~ R.T. 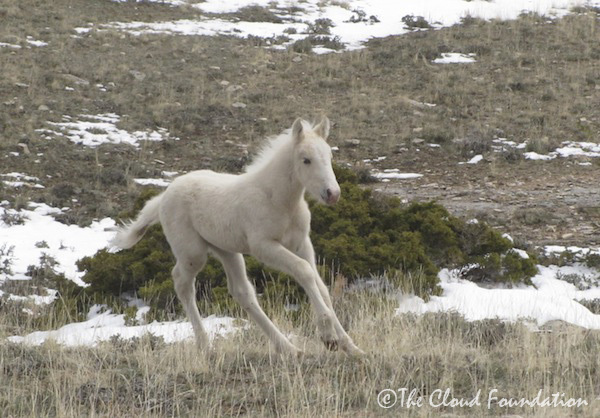 I know many of you have already sent in your comments to the BLM regarding the planned permanent removal of 30 young Pryor mustangs, but I’d like you to consider adding a special plea for Echo, Cloud’s little grandson (BLM name is Killian). 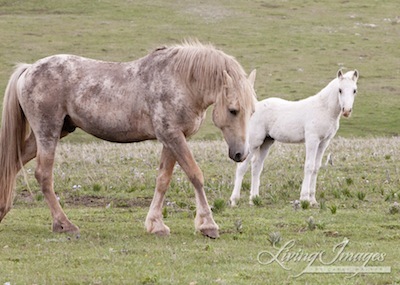 In April 2010, Bolder’s black mare, Cascade, gave birth to a pale colt. It was early May before Makendra and I could get up on the Pryors to look for the colt that supposedly looked like Cloud. We spotted Bolder and his family far out on a still snowy, finger-like ridge on Sykes. We could see a little colt lying in the snow under a juniper tree. He looked snow white but, on closer examination, I could see his stockings and the blaze on his face. On the tip of his nose he had a pink snip, just like his great grandpa Raven, his grandpa Cloud, and his father, Bolder. I named him Echo because he looked so like Cloud. But, I was to learn that his resemblance to Cloud was much more than skin deep. We laughed as he ran and lept off the ground. Here he is playing on Sykes Ridge when he was a few weeks old. His dun sister had been born in the snow on the day Makendra and I hiked out to photograph the band. Here is footage of curious Echo meeting Kicks-A-Lot (BLM name is Kiva) when she was just one day old. Outgoing is an understatement for Echo. In the months that followed I watched him develop into quite a precocious little fellow. He played with yearlings when he was just a foal. As a yearling he would march right up to band stallions. Well, I thought, you’ll become a great band stallion if you don’t killed first. His brave, yearling exploits usually ended with him running back to his mother to nurse! Echo playing with the yearling, Shaft, in summer 2010. Both could be removed in 2012. 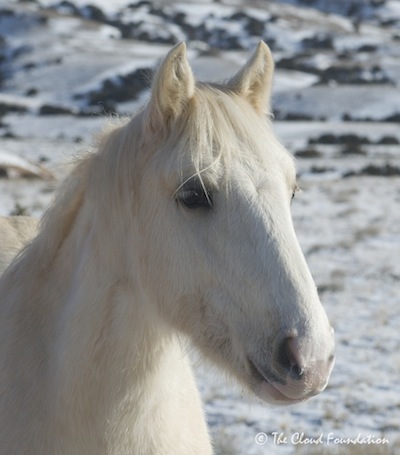 Echo has unusual genetics (his mother is perhaps the only off-spring of Cloud’s rival, Mateo) and he is the only young palomino on the mountain. He is a powerful, athletic colt who will pass on his strength to his offspring—if he gets a chance. The removal of Echo will be a personal tragedy for me. Although I believe that Cloud will live for many more years, he will not live forever. When he is gone, we will still have Echo as a physical reminder of the great stallion who inspired me, and so many of you. I ask you to speak up for Cloud’s Echo. Thanks so much for fighting for his freedom! P.S. 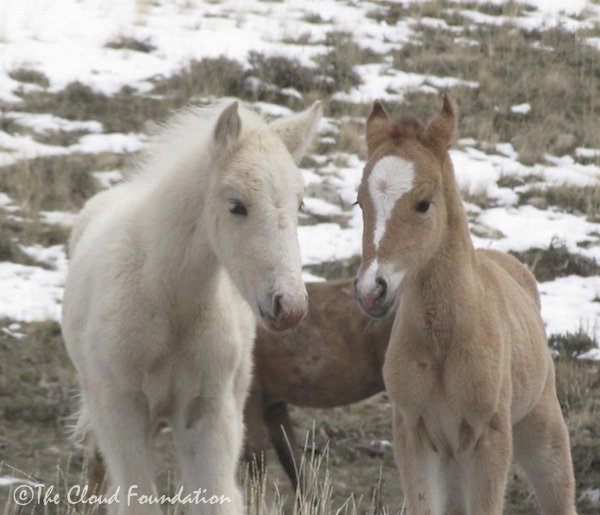 The Cloud Foundation does not support the removal of any young horses from the Pryor Mountains—certainly not at this time of year, and certainly not 30 youngsters, which will leave the herd under populated and vulnerable to eventual die-off. WHY do these people not see their own heartlessness? How can they work there and have no feelings for the horses? Are they burned out, desensitized? It breaks my heart that we can’t protect and save our wild horses from round-ups that injure and terrify them, and from having their freedom and even their lives ripped away from them. Can’t different groups for Cloud and his herd sit outside of stores such as walmart with petitions and information to educate the public? Many more will come to Echo’s rescue then! This would be too sad and thoughtless as to the genetics. I know, they don’t care. But the address of Jim what’s his name would be helpful in both of the articlers. “Echo” and this one. Thanks. I am so sick and tired of seeing what the BLM is doing to OUR wild horses on OUR PUBLIC LAND!!!!! I’m sick and tired of them being above the law! They are NOT protecting the wild horses and burros, they are systematically anihilating them! The BLM needs to be disbanded and prosecuted for animal abuse. This cannot be tolerated any longer. I will not vote for anyone who advocates the removal of ANY more horses from the range. Until private cattle are removed from public lands and the big oil companies are restricted from destroying the habitat for all wild animals, I will continue to flood my representatives with e-mails, phone calls and letters to stop this insanity. I don’t understand why, with so much documentation and proof of the cruelty visited upon the wild horses, that nothing can be done to stop it. Where is Mr. Obama … what happened to his promise??? Gone the way all other campaign promises have gone. In the circular file. BLM needs to be stopped in it’s tracks! I don’t understand why the BLM feels it can’t wait until the actual number of Pryor mustangs has been determined, since horses beyond those we already know about are bound to have died over the Winter, and foals are often miscarried or die or as well. I also question why the option to take a few at a time was removed from consideration. Maybe it has something to do with the lawsuit, since we know, suits against the BLM make them more determined to punish the litigants. The BLM may consider Ginger’s films about Cloud a thorn in their side, but, IMO, his story has also facilitated exposure, not just about the plight of wild horses, but their value as well. More people want to adopt Mustangs, and I feel learning about Cloud and the other Pryor horses has contributed to that interest. Eventually Cloud will pass away, and what better ambassador for wild horses in the Pryors and elsewhere than Echo. I agree, Linda. We want people to love these wild ones where they belong and doing what they have for hundreds of years. This is how to promote them to our public. The beauty and the family bands and the fact that anyone can come and observe them on their HMAs and camp out and be there with them is a wonderful experience for anyone to have. We know what roundups do. We need to address what becomes of all removed horses. But we need to Constantly Celebrate our Wild Horses and Burros for what they have given us throughout their existence here as a returned native species and specially protected wildlife. Our government is wrong and the BLM is not preserving them. The Wild Horse and Burro Program needs to be cut free of DOI/BLM because they are destroying the ranges, their genetic heritage and their future without our permission. Policy is not law and it can be changed. We need legislation that is unbreakable. I am offended by BLM removal, transport, and warehousing of horses and burros on my dime. I am an equestrian and used to be a good-hearted BLM volunteer. I teach in a college Equine Studies Department. I have a B.S. in Agriculture, specializing in Watershed Management. Some of you know me from advocacy events over the last few years. One separated family band, one separated pair, one orphaned foal, one injury or death, is too many, for these reasons, with our money. One picture is worth a thousand words: Terry Fitch’s photo of cattle going onto the Antelope Complex AT THE SAME TIME horses were being FORCIBLY removed says it all. “The Fence” on the Pryor Mountain HMA is an insult and injury to Echo, her family, and all wild equines. Try as I might to believe in my government, I fail to find any “protection” left for wild horses and burros on their own home ranges, as mandated in the very first words of the Wild Free Roaming Horse and Burro Act, in its own opening statement of purpose: “To require the PROTECTION, management, and control of wild free-roaming horses and burros on public lands.” Try as I might to believe the path of destruction the DoI is laying for our horses and burros might end, it goes on blindly into a wilderness of injury and death. Except for a few, an emasculated Congress and a President who turns his face away continue to run our horses and burros over the cliff. I think we need a teach-in about wild horse and burro removals “around” a BLM field office in 2012; or “around” the DoI Building in Washington,DC; or at “The Fence” in the Pryor Mountains HMA. I think several thousand of us need to be there to teach each other, Congress, the American public, and the world, what is going on with America’s horses and burros, and the darkness they face at the hands of our government. I think we need to show the world what the insanity of 40,000 horses and burros removed from their home ranges and in captivity looks like. I wonder if there are people reading this who will help me. Because it is already late, and the DoI-BLM-Special Interest machine does not sleep. I’m with you Rob. I’m sick of this. But I saw what happened when we protested in DC. NOTHING!!! We had more then 200 there then. So we will need many more this time. What do you others think? We need people out there to visit and learn and we need wild horse lovers to stand together and stop this senseless destruction of individuals and families. This year we do need to meet out there and show we will bring more people in the future and we, the people, can have ‘standing’ because we want to study and protect and preserve these wild ones. What is BLM’s standing when they keep removing the wild herds in preference of corporate developments? How can those who capture, kill, and hoard our wild ones have any standing at all? Their self engineered ‘rights’ to carry out these actions have become the drain hole into which wildness and designated ranges are given no heed. Conflict of interest flourishes where the Last Golden Age of the wild horse in North America has already passed all of by loaded into semis trailers bound for uncertainty and loss. They have taken so many and they are the finest our nation has seen born free. This is the tragedy of a law and lawlessness. We have so much to do. Let’s be sure to get this done. Rob, you are speaking from my heart! I have been saying the same for years. As a matter of fact I have Foundation, Wind Horse Foundation, where we re doing exactly what you are recommending. I educate young riders and sponsor them in competitions on my Spanish Colonial Mustangs, to become the “Ambassadors” for our Wild Horses. We take information and present the TRUTH to the public. I feel a presentation at Congress is in order since the situation reached “critical”! The sad part is that these horses and others are taken to sales…..If they are not sold by 2 or 3 sales then they are loaded up on a truck about 60 at a time, crowded, hungry and thursty and sent to Mexico!!!! I have seen it with my own eyes and teared up as they were leaving for their final distination. What a shame, please let these beautiful creatures run free as God meant for them to…..
in Washington DC with the idot numbers and names of the trucks..showing them the proof. They must be stopped!.. I don’t doubt you, Terry. Could you please provide the information that proves your statements? Did I miss the links or something? I don’t see them. Click the PS at the bottom of the post. OOOPS!!! It didn’t light up when I went over it the first time. Thanks!!!! Thank you for the address. I snail mailed myoriginal letter and will do the same with this one. Thanks again. This round-up is nothing more than retaliatory by the BLM toward the Cloud Foundation. Yep!!! !…ask WWP what to their wild equines on the Greenfire Preserve. They (BLM) are freaking braindead, flatliners, fill in the blank. Do we have any hope that the court cases will be heard before this round up to extinction? Nope….the history speaks for it’s self. However, since the changes to the 1971 Act, it is clear the changes are illegal (in my mind) because the changes counter the intent of the original Act. The changes and ability of the BLM offices and the Sec DOI are so wide in interpretation, plus the removal schedule and PEER expose’, it is clear, DOI, the White House and Congress are killing/exterminating wild equines; not protecting or managing. The judges interpret the law (the law is BS and contradictory)… they are interpreting an illegal law and availing too much interpretation to the responsible authority. They also like the “moot” thing too much (aka overcome by events)….they hardly ever immediately give injunctive relief to our side….when they do, the round up is already over. The only judge I can find that gets it is that female judge in Colorado and look what the grazing association is doing to that (with other herd areas, too). BTW, just because I don’t think there is a chance (hope? ), doesn’t mean it is not worth trying. You forget Judge McKibben who has helped Laura. I will not comment on an ongoing case. I will wait and see. I do have opinions on the course of this trail to date. But to make any comments on that specific case would be reckless (to me any way). God put these majestic Families of Horses on earth to be Free. If God didn’t want them to be free God would not have ever let them live free. It is very selfish of the blm people to destory Cloud’s Families along with the other Horse Families just to put a rich person’s cows out on the range. People of the blm HOW DO YOU SLEEP AT NIGHT? Jesus will return to earth riding a white Horse. BLM DON’T MESS WITH GOD’S HORSES. Why doesn’t the Cloud Foundation get an injunction to stop this? The removal will bring the herd to the “Appropriate” Management Level of 120. This drastic plan is completely unacceptable and dangerous for the future survival of the Pryor Wild Horse Herd. •	The herd currently numbers only 150 adults (one year and older), the bare minimum to maintain genetic viability. •	In 2011, mortality equaled births which is exactly what BLM states as their goal for the herd. •	The PEA includes an alternative (which was considered but not analyzed – why? ): “This alternative consists of initially removing ten wild horses and re-assessing every year until the recruitment rate is equal to the natural mortality.” This is already the case! In 2011 mortality equaled recruitment (surviving foals). Bottom line, it is dead wrong to remove any horses of any age before knowing how many foals are born in 2012, how many horses survive the winter, how many foals survive going into the fall, and the level of predation. We’ve just learned that the BLM Field Office in Billings has extended the comment period for the Pryor Mountain Wild Horse Preliminary Environmental Assessment (PEA) until January 20th. Emailed comments will be accepted (BLM_MT_Billings_FO@blm.gov), but physically mailed comments are encouraged (Jim Sparks: BLM Billings Field Manager, 5001 Southgate Drive, Billings, MT 59101). They keep saying that the herd size has reached 150. Just two years ago they removed enough to get the numbers down to about 110. So, if the birth rate this last year was equal to the loss of lives, it would mean that the birth rate in the previous year equaled almost half of the total that they allowed to stay up there from the roundup they preformed!!! Don’t believe the numbers!! Right! No reason for this. No reason to do it in the middle of January. None. So tired of the nonsense. These people just look for something to do to justify their paychecks. Disagree…there is a reason. If you get rid of the protected species, you don’t have the EA requirements coupled with the privatization of public lands and their resources. This is not just incompetence and stupidity, this is a calculated plan to control open space and resources for special interests, especially water. Soon, we will be reading about lands taken from citizens via eminent domain through that crazy quilt of patchwork lands that state and feds manage and reclassification/use. Dear Savewildhorses, there is nothing the BLM can do to Justify their paychecks they have been wasting tax payers money for far to long on needless round ups, After seeing the beauty that the Pryor MTS houses how can we as civilized loving caring people who know the intense usefulness of this Beauties , stand idly by and watch these murdering morons desecrate them and their homes , they live in peace and beauty , The BLM is suppose to be protecting them????????? What is so damn hard for them to understand, this has gone on for so many years it is time to put a STOP to it……………………..
R.T., your lead in comment to this story is absolutely correct. Those individuals in the Billings office are doing the things to the Pryor herd just because they feel they can. I once attended a pregather meeting they held in Billings, Montana for a Sept. roundup with Ginger Katherns and several others who had some very good comments and where most of the talk was centered around holding off until a spring date and more information stats could be gathered. I happened to be sitting close to the table that the BLM personnel were sitting and at one point, Mr Jim Sparks lowered his head and kind of under his breath said “We are still going to gather them.” so the audience won’t hear him. But I was close enough to hear him. I think he does these things to keep his job intact. That way Washington knows he is still doing something. I happened to attend another meeting prior to the next roundup they planned but Mr. Sparks didn’t even bother to come to that one. There are so many things that organization could do to manage that area, like work with the Forest Service, that would be better than just removing a bunch whenever they feel like it. Unless, of course (and demonstrated history) their job is strictly to remove. I would say that is what the USDA/BLM documented history proves. If you are at a meeting and you hear him say this under his breath. I would ask him to speak up so all those present could hear. Too often we are taken back or afraid to speak up. These guys get delight in knowing they can comment because they feel we are afraid to speak up. Its time to let everyone we hear their trash talk. We cannot change people’s actions through hate and anger. We must and can only affect change by raising their awareness/consciousness/heart energy – whatever you want to call it. What you resist will persist. Gandhi knew this, MLK knew this, Mandella knew this. Those powerful negative emotions arising from this barbaric situation must stir us to direct our own energy toward positive solutions, to knowing that our thoughts collectively can make great changes, that people in power controlling positions can “have a change of heart”. Maybe it seems “fu-fu”, but think of the times it has worked in your own life, throughout history, and know that collectively our positive energy can change the world, starting with these animals and our incredible love for them. I aboustely have fallen in love with Echo hes gouregous and im very mad at the BLM for taking these horses out of their habitats and then with the cruel deaths of the other mustang were running out of time to save these precious horses They should be respected just like the american eagle and i would hate to live in a world without these beautiful gouregous creatures running free and once agian i have fallen in love with Echo hes gouregous hes funny and i will be crying my eyes out if the BLM kills our precious Echo . And another thing i dont belive God Is very happy with the BLM for rounding these beautiful creatures up the ones he made to Run wild be strong and be forever free . Does the BLM not have ANY feeling for these special horses that are part of the American heritage? It would be doing all Americans an injustice to move ahead with the plan to remove the young horses. Not only will it disrupt the gene pool but it’s going to wipe out the lineage of this herd. Can’t they just leave well enough alone? Nature will take care of the numbers naturally. It rips my heart out what government has done to all the wild horse herds…cruelly, inhumanely rounding them up, stuffing them in holding pens until time to send them to be slaughtered if they don’t get adopted. What a slap in the face to the the horses and the American people. And if the round ups are so humane, why is it not viewable to the public? Well, because they will get caught in the act of doing what is being denied. Yeah, everyone knows. Well, for all you heartless BLM people, I would hate to be you. How can you live with yourselves? JUST LEAVE THEM ALONE! PLEASE!!!! OMG it is hard to imagine that anyone would want to take these animals away from their wild heritage!! These animals should be treasured and protected! What is the matter with Canada and the US?? I live in Canada and we fight tirelessly to end the slaughter of equines here as it is so barbaric and cruel.Your US horses are coming here to meet their grisly end–it is all so reprehensible and sickening!! What is the matter with our governments? ?We need to make more people aware and demand an end to the cruel exploitation of all animals–this is nothing but a way for the greedy low lifes of the world to make a profit. We are supposed to be civilized-there is nothing civilized about terrorizing and capturing beautiful wild horses that should be fiercely protected. I cannot believe that. How can the BLM be so thoughtless? I will not stand for them taking away Cloud’s herd members, especially little Echo. This will not happen while the ones willing to protect Cloud and his herd are willing to stand up for him. It Is time for OCCUPY OUR LAND, I as do many others care deeply for the horses as well as the land it self> This is our heritage and our children,s and if it were up to the BLM it would be sold off or just given away. Stand up America take back whats your and protect it with your life!! The alternative is not acceptable!! Is 30 horses really worth the effort, money and bad publicity? 30 horses. As Ginger points out, there was zero% growth in this herd in 2011, so why are they doing this? Looks like the herd is doing a fine job managing itself the way nature intended. Time to stop the BLM interference and harassment. Leave these horses alone! No one wants you there, BLM! Get lost. RT, I agree with Rob on this one. After all we’ve done, said, collaborated on and shared… even after traveling across the country to Washington D.C., nothing has changed, anywhere. I was hoping it wouldn’t be necessary, but at this point I feel a show of physical strength, in the form of sheer numbers, is the only way to stop the BLM. We need to go ‘en masse’ to every roundup, enough of us present to outnumber them, then literally lay down in front of the trucks and trailers to physically prevent the BLM from removing another American Wild Horse from OUR public lands. Let ’em call out the National Guard to remove US! THAT will make the CBS 6 o’clock News. Some of us will undoubtedly, go to jail, but those willing to make that sacrifice will volunteer and I am one of them! Let’s DO it, Rob. Damn the torpedos – FULL SPEED AHEAD! I agree I will stand for them !!!!!!!!!!!!!! With all due respect and I understand where your coming from but Obama just signed that NDAA law. This gives the government the right to incarcerate you for an indefinite period of time. They don’t have to charge you. They can say that “sometime in the future you are going to be a problem” therefore you need to be held under what they call “PROLONGED DETENTION”. Besides with the contractor they have they would run over anyone who laid down in the road in their path. No second thoughts. You were in the way. Blocking them from being able to do their job. These are NOT NICE people. They don’t operate with a full deck. Please keep the BLM out of Cloud’s herd and out of Pryor Mtns. Can’t they find something else to do besides harassing herds with zero population growth and building weird fences in the middle of wilderness areas? Hands off Cloud’s herd, BLM. They aren’t bothering a soul up there. Leave them alone. 1.3 also states that this gather is needed “to restore and maintain a thriving ecological balance.” (page 5 of the EA) BLM’s interpretation of a “thriving ecological balance” seems broad at best, and by comparing these few burros and any damage they might cause to other projects/uses, and the damage to the environment those uses cause, it seems BLM is PERPETRATING FRAUD on the American public……..
BLM keeps your hands off the Pryor Mts Wild Mustangs , you would do better getting rid of the Rats in New York City, you can earn your paychecks there//////////////////////////// Do something worth while !!!!!! Why don’t they go investigate all the fracking pollution on public lands instead of harassing 30 horses who are bothering no one and nothing! I am so upset about this. For how long do we have to put up with the BL Mismanagement? The insensitivity and lack of intelligent, creative methods that is needed to deal with the wild horses will have a far reaching negative impact. Posting these comments is useful only if forwarded to the President and/ or BLM. We as tax payers do not want these Horses removed from their only home they know..I can not help but notice that BLM is removing at alarming numbers and I have to ask why?I will and can bring this awareness to many peoples attention!You do work for us and we demand you stop the Roundups..or we will make it a point to see those in charge or those boots on the ground in COURT! !Stop the insanity against them..they are part of the Iconic American Landscape!! The BLM has run rampant on the Pryor Mountain herd for far too long. They have been instrumental in destroying much of America’s history through their decimation of the herds of mustangs. Will it ever end? We Americans want them to leave our herds alone. When it comes to weapons of mass destruction I think of the BLM and other horse hating groups whose only motive is greed. Stop destroying the wild horse herds and especially leave the Pryor Mountain herd alone. I support Ginger Kathryn in her documentation that has made Cloud and his herd famous. Thanks to the Cloud Foundation. The BLM’s destructive so-called “management” of the Pryor Mountains Wild Mustang herd is a disgraceful mis-management of the trust that the American people have been forced to release to them. The un-necessary round-ups of our wild herds must cease now. The BlM refers to the wild horse advocates as nut cases. Who are the real hardened – uncrackable, nuts in this annihilation? They don’t seem to mind all the bad press they get, in fact I’ve begun to think they use it to serve their agenda. Greetings for 2012! Hopefully this will be a year to reinstate true fairness for the wild horses of the Pryor Mountain and elsewhere. I have just reviewed your Environmental Assessment and am very much opposed to your proposed plan to remove thirty mustangs from one to three years of age. There is absolutely no necessity for doing this, and this removal jeopardizes the long-term survival and adaptation of this very small herd in future times. The Pryor herd is presently stable at ca. 150 horses, and these horses are well on their way to filling their niche and self-stabilizing according to the natural world’s criteria that confer long-term survival value, rather than the artificial selection by man. There were eighteen births balanced by eighteen deaths in this herd in 2011, indicating utterly no need for gathering these returned North American native species. The 92-117 Appropriate Management Level is a non-viable one, even according to the substandard standard BLM generally puts forth, i.e. 150 total population for an effective breeding population (Ne) of 50. And as a wildlife ecologist well informed on this subject, I consider this level of 150 to be way low in itself, as far as long-term viability. I further consider the taking of this age group as an unwholesome undermining of the herd’s natural vitality, social well-functioning, and resilience in face of both short- and long-term survival challenges (e.g. approaching winter). I wonder just exactly what your motivations are in treating this unique and universally appreciated herd so niggardly! The Pryor Mountain herd is a world attraction. It should not be cut to the quick, most of all for the individual horses’ sake. This would accord with the true intent of the Wild Free-Roaming Horses and Burros Act of 1971—an act we should now be celebrating, though actions such as you propose are only causing fair-minded and sensitive people to lament what has happened to this program for national heritage species in the wild. Please give me a cause for celebration on the 40th anniversary of the act by adopting the NO ACTION alternative and exerting your authority to convince Custer National Forest officials to tear down that abominable fence that illegally keeps the Pryor Mountain mustangs from realizing their traditional, seasonal migrations that are guaranteed by the act, for long-realized by the wild horses both during 1971 and for many generations prior. As one who has directly observed the Pryor Mountain mustangs and intends to continue doing so as well as to fend for their higher, fairer population numbers and resource provision, I wish you a happy and progressive New Year. Craig C. Downer, AB, MS, PHD cand. Bravo, beautifully written Hr. Downer, but can you reason with Moron s??????????????????? ?/ I think History answers that Question ????? If we overlap in contacting Senators, Representatives and Governors, that’s all the better. And they need to know they will not be getting our votes or support if they don’t abide by the will of the people to protect the wild horses and burros. The wolves are also in extreme danger of extinction and hunting them just for the kill is being encouraged. They need to know we know what’s going on and they have to make sure to STOP the hunt, roundup, abuse and kill off our wild herds and packs. Please do not remove 30 young horses from their home. I think the large removal of the horses is horrible! They need to leave Clouds family alone. I understand removing a few. The herds can’t get really big. They need to realize the tragedy this large removal can bring. Real horse lovers need to be asked to help pick the horses that are to be removed. I have always loved seeing wild horses. They are a wondeful part of America. I don’t remember any roundup, anywhere, where the focus was the foals and youngsters. However, the BLM has done similar outrageous when they feel highly threatened and retaliate by “stick it to ’em,” meaning the wild horse advocates. With all the BLM has done to our wild horses, this plan is the max. For it is to destroy Cloud and all he represents. Cloud is the Poster Horse for the wild horses. No longer will people follow Cloud on PBS. And I for sure see this as an attack on Ginger Kathrens. She has been compared to others following, documenting wildlife: Jane Goodall, Dian Fossey… These women also ran into trouble working with, advocating for their animal of choice, chimps, gorillas, with Fossey permanently shutdown. To roundup the foals leaves only the older horses. They too will be rounded up, and those left, die off. Importantly, there will be chaos within the herds. As before, the BLM ups the ante, and we follow suit. Something massive needs to be done here. Letters, petitions, yes, but we have been there, done that before. The BLM needs, by protocol, to post timelines for comments, and disregards, always. This new move by the BLM has implications beyond the roundup of the young wild ones. I never forget those BLM “Secret Documents,” obtained by FOIA, June 2009 to destroy, eliminate the wild horses. I assume this roundup of the young ones is the start of doing the same, herd-by-herd, state-by-state. Very genocide and control the state thinking from DOI re foals of Pryor. However, like some other wild equine herds with public provenance, this is a big money maker, all the while achieving extermination with a tired old twist. If you remove the children (foals in this case….and let’s define foals and show transparency of what animals die, are injured and eventually removed in this holocaust)….you remove the natural order of life and therefore existence. Ergo…proves what they (DOI/USDA) are really trying to accomplish. And that the fence went up without proper judicial consideration (seasonal migration) is an indictment of our society, government, judiciary and values. (2) the youngsters are “valuable” and easily sold for their cachet as Pryor wild equines…plus, they are easily trained and handled versus older wild equines (if they survive the roundup and separation stress). Just for clarity, and it does not make it right, the BLM intends to use “Bait and Trap” with no helicopters on the kids. OK…thanks for the info, but what will happen when they try to separate the youngsters from the parents? What will the traps consist of? Those disgusting pipe panels that equines can put heads and limbs through that get injured and broken? Did I get the intent re: resale of Pryor youngsters and/or still reducing the herd wrong? Forward any Cloud articles to Jane@CNN.com and also to news-tips@nytimes.com and any other media outlets you know. Anyone have an e-address for Disney? BLM wants a poster child for their assault on Cloud— they ‘ve got it. Start an International effort– email this article to your contacts around the world. Include the BLM email address in your message. Every herd is a treasured herd. We’ll start with this one. Lights,camera–action! It’s obvious, even fto an outsider like myself from Canada, that there are hidden deals being struck behind closed doors. The BLM people don’t care about horses and burros because all they care about is receiving fat envelops from the Beef Lobby and oil companies. That may be why they can still act with complete impunity : they are protected by high ranking officials whose campains have been financed by interest groups. A very dirty mess indeed ! Good luck with your fight ! Wish I could do more. Dear Denise , If we all have ever witnessed wrong that defies explanation and reason , this is it for sure !!!!! Let us know how things are proceding on any action to be taken physically to stop the roundups or be somewere in numbers, I have always thought that may be a good way to get our word out other than just e-mails, letters and etc. I know that some people just want to take the peaceful aproach ~ but it has always been my feeling that the squeeky wheel gets the grease. Why as an American do I feel so very helpless. Is there any true and responsible representation of the people anymore? Bravo to the Canadian pointing out the real powers at work here. The almighty buck, so short sighted, so short lived. The culling of the herd will only end in its ultimate demise. Do they really think no one is watching and figuring this out? Thank you Kathryn for your work, both beautiful and informative. Where is the pride? Where is the preservation of our fragile past? To see such wild beauty preserved is a gift. Can these people not know the meaning of compassion and American icon? It’s not just these specific bands, it’s ALL the bands that need to be protected from the morons in the government. Just watching the episode I did online, shows plenty proof that nature and predators take care of populations. Humans always see a need to screw things up. And then the funny thing is, horses are native to North America, humans just reintroduced them. The land can handle it. People need to give horses their credit, the country was built on the back of a horse, mule, donkey and I have to include bovine. But the horse was #1 in transportation, pulling, carrying, even feeding humans with their meat; we’ve used them now they deserve their freedom from us. There is not a day of the week time of the year , That could even be considered to ever remove the Federally Protected Mustangs from the Home that according to the Law ROAM ACT 1971 UNANIMOUSLY VOTED BY CONGRESS, and as for removing Language from the ROAM ACT without the knowledge and written consent vote of Americas Citizens should never be done when we are paying our money for their protection…. We need to protect Echo and the Pryor Herd. They must be protected to live on the Pryors herd and as a family. This herd must not be touched ever. They are so special indeed. We must stand out there with them if we have to. Law enforcement and protection men and women we need you to help us to protect our horses. Come on board with us and protect them. The Clouds group is very special and we must make every effort to save each one of them and preserve them for eternity. Thank you Ginger Kathryns for your remarkable work and documentation on this incredible herd. I love them all. I am following this beautiful herd because of your work. I will be there to protect them when you need me. Let me know what I can do to help. I love all of our wild herds but I love the Pryor”s herd dearly. Cloud’s legacy must be protected forever. Freedom for Clouds family, Echo and young ones who will carry on the genetics of this great herd. We will make sure they are protected somehow we will. These horses should be kept wild and free as they belong. We also need to stop the cruel helicopter roundups. I have to say what I feel in my mind !!!! If we let them do this SHAME on us at one point we have to take a stand and the responsibility for for letting them get away with this , as a American who knows right from wrong, we cannot believe we have done everything we could because we have not …………………I am ashamed of us……………………….if i were asked I would say we go for the Jugular…………………………………….. 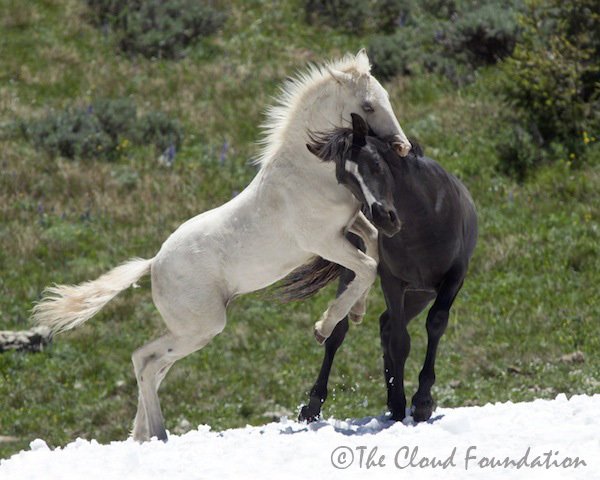 Please preserve clouds history and family of beautiful horses in the wild! Really learned alot about horses on the DVD I got from the library. I suspect that the BLM and the ranchers and extractors won’t rest until the horses are gone.